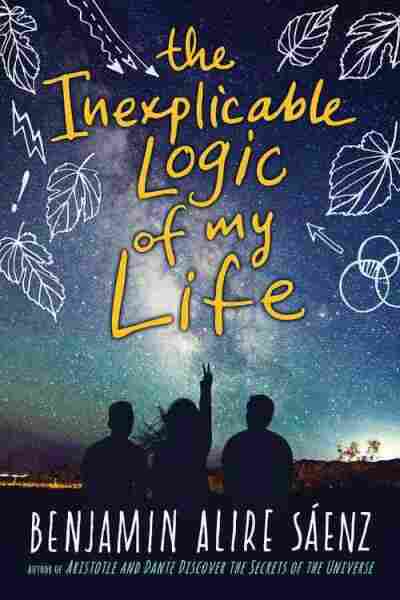 Book Review: 'The Inexplicable Logic Of My Life,' By Benjamin Alire Saenz The Inexplicable Logic of My Life is as much a doorstopper as any young adult fantasy novel, but the world it builds is inside the head of teenaged Sal, who's struggling with difficult new emotions. In the realm of young adult literature, the biggest tomes are usually fantasies, the kind that require several hundred years of history, culture, and politics to ground an intricate plot. The Inexplicable Logic of My Life has the word count of a book with worlds to build, but rather than using its pages to explore the confines of an imaginary land, it delves deeply into the complex inner world of one teenaged boy. Sal begins his senior year with an unfamiliar fire burning inside him. He's always been a good kid, firmly enfolded in the love of his gay adoptive father, their extended family, and his best friend Samantha. But suddenly, every cut and insult sends him into a violent rage. The more fights he gets into, the more he wonders about the source of these impulses. He worries that some terrible gene he inherited from his unknown biological father is taking hold of him. As the year progresses, Sal struggles with his identity, flailing around in relationships that have been the steady heartbeat of his life — until now. Sudden tragedies force Sal and his loved ones to pull together when it would be easier to drift apart, leaving them to come to terms with loss, hope, and acceptance. Benjamin Alire Sáenz is a poet as well as a novelist, and his language here has a sharp musicality. Staccato sentences form a barrier around the protagonist, at the same time as his earnest first-person narration invites the reader inside. This push and pull mirrors the dance that Sal is doing with his loved ones as he struggles to reveal what's truly in his heart. It is difficult to talk too much about the plot of this book, as it follows a year-in-the-life format, using emotional battles and breakthroughs as its climactic peaks. Its true strength lies in the complex and sympathetic characters that populate Sal's world, and the way they work together to build an unconventional family. On the subject of family, it must be said that there are an awful lot of dead moms in this book. By the end, so many mothers have died that it's a little hard to keep track of whose ashes are being scattered at any given time. It feels a little excessive, to the point where at least one death was rendered almost absurd where it should have been tragic. Father figures, with the exception of Sal's adoptive dad, are also conspicuously absent, gone before they could contribute much more than DNA. It's an interesting choice in a genre that is famous for killing off and sidelining parents in creative ways so that teens can get into trouble without having a grown up around to sort them out – but that clearly isn't the choice here. Sal's adoptive dad is a constant presence, and there are a variety of aunts and uncles orbiting around the family, ready to do the work. Here, the death and absence of parents is a litany of loss written across our characters' lives. Sáenz tackles issues of race, queerness, feminism, and poverty with a deft and gentle hand, wrapping up the things that could have made this into an "issue" book into a journey of self-discovery and acceptance. These characters feel like fully realized people, and Sáenz gives us a window into a brutal and beautiful year in their lives. Caitlyn Paxson is a writer and performer. She is an editor at Goblin Fruit, and can be found discussing folklore and pop culture on the Fakelore Podcast.